"When I started my research in 1983, I figured that the only coat of arms that I needed was for the Hill side of my family. Now, nearly 20 years later, I see that the Hill coat of arms is only the first in many of that same name... Not one of the crests depicted herein are mine nor do I claim any. They are merely the visual symbol of a surname." As Daniel and I soon realized, there is no ONE Coat of Arms for the surname HILL, rather there are many, indicative to the place and origin of the family. I, as Daniel has said, claim no certain Coat-of-Arms for my line - this requires tracing your line back to the original recipient. 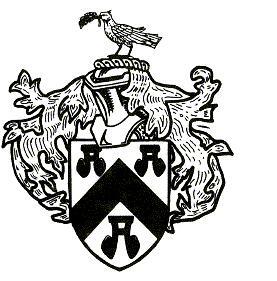 Instead I have attempted to gather together ALL Coat-of-Arms information concerning the surname HILL in one place for researchers to see and form their own opinions. To properly document each, we have listed all found so far, and give due credit to those that have contributed to this work. We claim no authenticity to any particular coat-of-arms, and realize that one or more could be phonies. Some information from the coat-of-arms descriptions may be repetitive. 1: English: extremely common and widely distributed topographic name for someone who lived on or by an hill, Old English "hyll." The sound represented by Old English y developed in various ways in the different dialects of Middle English. Traces of these regional differences may be found in the variants, in spite of the influence of the standard English vocabulary word. 2: English: from the medieval given name Hill, a short form of Hilary (a personal name from Latin Hilarius, a derivative of hilaris cheerful, glad from Greek hilaros propitious, joyful), or of one of the Germanic compound names with the first element hild battle, strife. 3: Low German: diminutive of Hildebrand, a personal name from Germanic hild + brand battle + (flaming) sword. 4: Jewish (Ashkenazic): anglicized form of various like-sounding names. Cognates (of 1): Dutch: Van Heuvel. Flemish: Heuvelman, Van den Heuvel, Van Hille, Van Hulle. German: Hiegel (Alsace); Hügel, Hügelmann, Hüggel, Hüggelmann; Hügler. Low German: Heuvel, Hiebel, Hiebl, Höbel, Hövel, Hübel; Hibler, Hiebler; Hübler. Jewish (Ashkenazic): Hillman (reason for adoption unknown). Patronymics (from 3): Low German: Hillemans:, Hillen. Variants (of 1): Hell, Hull; Heller, Hiller; Hillam (from the Old English dative plural hyllum; also the name of a place in Yorkshire West Riding); Hille (from the Old English dative singular hylle); Hillman; Hills. (of 3): Hille, Hillemann, Hillmann, Hilmann. The very first record of the family name HILL was found in Worcestershire, which is located in England. The HILL family traces their ancestral roots back to Norman origin before the year 1100. From here they branched and migrated, gaining prosperity as a notable family of England and later other countries. Writers of the past have ascribed symbolism to the tinctures and charges of heraldry, thus sable (black) is said to denote wisdom, or (gold) generosity and gules (red) magnanimity. An escallop was in ancient times the emblem of the pilgrim. The HILL family has been prominent in England since the Middle of the Fourteenth Century, and since the time of Queen Elizabeth, has been held in considerable esteem in the counties of Down and Antrim, Ireland. Early records mention Gilbert Del Hil of Norfolk in the 1191 Pipe Rolls, William Attehil in the Cambridgeshire Assize Rolls of 1260 and Alan Del Hill in the Essex Hundred Rolls of 1273. Sir Rowland Hill (1492-1561) was the first Protestant Lord Mayor of London, and Thomas Hill was a popular portrait painter who died in 1734. William Hill who came from England on the ship "William & Francis" to Boston Harbor in 1632, is recognized as the progenitor of the Hill family in America. He achieved many distinctions in Massachusetts, and later in Connecticut, where he removed in 1644. He apparently died about 1649, for records of that time refer to his wife Sarah as a widow. Among other early emigrants from England to America were Edward, Hanna, and Elizabeth Hill who are recorded in Virginia in 1623. Benjamin Harvey Hill (1823-1882) was an American political leader, who took part in organizing the government of the Confederacy, and David Jayne Hill who was a noted American historian and diplomatist who died in 1932. For more information concerning the branches of the HILL family, the following references are suggested: General Armory ... Burke, Colonial & Revolutionary Families of Pennsylvania, Vol. XI, Tercentenary of New England Families, Vol. 2, pub. by American Historical Society. This information and was image was published by Morris Bros., deVillers & Co., Inc.
BLAZON OF ARMS: Argent a chevron between three water bougets sable. CREST: A dove argent in the beak an olive branch vert. The earliest recorded Hill coat-of-arms is described in ancient heraldic records as: ARMS - Argent a chevron between three water bougets sable. Crest - A dove argent in the beak an olive branch vert. While there is no motto associated with this coat-of-arms, others have included, "Esse quam bideri" - Translation: "To be rather than seem to be." Hill is a locational name meaning "a dweller on the hill," derived from the Old English "hyll." The predominence of the name is easily explained by the frequency with which small districts had their local rising ground called "the hill." This also accounts for the widespread occurence of the name in Britain. Early records mention Gilbert del Hil in Norfolk Pipe Rolls in 1191; William attehil in Cambridgeshire Assize Rolls in 1260; Simon Hille in Worcestershire Rotuli Hundredorum in 1273. Some famous bearers of the name include Sir Robert Hill, one of the Judges of Common Pleas for Henry VI. Thomas Rowley Hill M. D. High Sheriff of Worcester in the 1870's. Matthew Davenport Hill (1792-1872) an English lawyer and penologist. M. D. (1832-35); judge in Birmingham (1839-65); advocate of reforms in treatment of criminals as release on good behavior, life terms without hope of parole for incorrigibles, his ideas were incorporated into Penal Servitude Acts (1853, 1864). Author of 'Suggestions for the Repression of Crime (1857)'. Rowland Hill (1744-1833) was an English evangelist. Ordanied (1773) but denied priestly orders in Anglican church owing to his irregular preaching; built Surrey Chapel, London. Sir Rowland Hill (1795-1879) English postal Reform; Began advocacy of postal reform with pamphlet submitted to Lord Melbourne, 'Post Office Reform: its Importance and Practicability (1837)'; advocated uniform low rates, prepayment by means of postage stamps; secured adoption of penny postage in the budget (1839); secretary to postmaster general (1846); secretary to the post office (1854-64). George Birkbeck Norman Hill (1835-1903) - nephew of Sir Rowland Hill - was an English educator; known chiefly as authority on life and works of Dr. Johnson.